(Indian Music Festivals Of 2017) In the peak time of the year, when everyone becomes a party-poise, who doesn’t want an overdose of music, food and drinks served all together? A lethal combination, isn’t it? To all the music fanatics out there- not in Europe, not in US, in India itself there are music fests that take you to the road of craziness, entertainment and excitement! So, here is the list of greatest Indian music festivals of 2017! Set in the lush Ziro valley of Arunachal Pradesh, ZIRO FESTIVAL is deemed as one of the greatest Indian music festivals which is set outdoors. The four-consecutive day fest is definitely a delight for the music lovers across India and the world. This music fest showcases talents of amazing artists from North-East India. It has been a stage for bands of national and international repute like Indus Creed, Sha’air, Louw Mjaw, Barmer Boys, etc. While you stand at 5500-feet above sea level, surrounded by mountain peaks and a loud electric music plays in your ear drums, nothing seems more grooving, vibrant, cherishing and sizzling than that very moment! 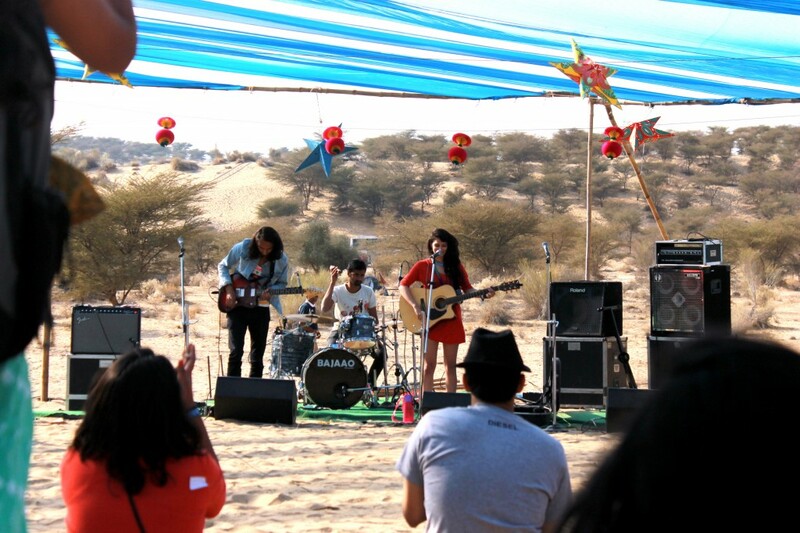 Indie, Rock, pop and Electronic music performances in the Thar desert of Jaisalmer, that’s what is RAGATHAN MUSIC FEST! The three-day desert camping music festival is one of the greatest indian music festivals that celebrates music, arts, and lifestyle. Set in the khuri dunes of Jaisalmer, more than fifty artists set fire on the stage every time they begin. Moreover, the music runs not on one stage, but on four beautiful stages concurrently. A crazy mixture of folk, jugalbandis, trance, Sufi, techno, rock, country music and Raga, fits perfect to the audience with a varied taste in Music. Who can miss the chance of visiting Nagaland and that too for a music festival! Named after a venerated bird named hornbill, this fest is one of the largest celebrations of the indigenous warrior tribes of Nagaland. Held annually in the month of December for 10 days, this festival showcases the rich culture and heritage of Nagaland. Musicians from all over the country and abroad participate in the Hornbill Rock concert to compete. In mornings you can enjoy multi-cuisine, handicrafts, handlooms and rice beer while in evenings lighten yourself up by the thrilling performances from the best talents. Naga chilly eating competition evokes much fanfare from around the world. With 40 bands and DJs performing at three stages, the MAGNETIC MUSIC FEST in Rajasthan truly leaves you magnetic! For three epic long days, give yourself a treat of music, art, food, and magic. Groove to the music of the local, regional and international artists while seeing them perform in the fabulous location of the historical Alsisar Mahal. One of the greatest Indian music festivals, it is a major crowd puller from Rajasthan, Delhi, across India and the world. Every year in December mesmerize yourself by the quirky fusion of contemporary music in the midst of the dunes of Rajasthan! One of the best and most popular Electronic Music Festival in India, SUNBURN MUSIC FEST is the craziest party with non-stop music and dance. The brainchild of Nikhil Chinapa, the festival is hosted in Goa annually, which draws a crowd from across the world. From hand-picked artists to globally renowned DJs, all cater to a huge crowd playing a variety of electronic genres like trance, Electro, Techno, etc. Afrojack, Avicii, Mark Knight, Markus Schulz, Axwell, Swedish House Mafia are some of the biggest names that have performed in the fest till date. It is a mammoth party with an amalgamation of entertainment, delicious food shacks, music, and shopping. The amazing Goa beaches, elaborate productions, colonial architecture and Asia’s largest single stage makes the experience a much more memorable one. It’s not just a music festival, it’s a carnival! And therefore, it is regarded as one of the best Indian music festivals.